Why you are paying more for less? Everyone is pointing fingers at everyone else when it comes to the reasons why the cost of private healthcare continues soaring into above inflationary increases year-on-year. Choosing a medical scheme is considered a necessary evil, the cost of which is reluctantly absorbed due to the ever-present of public healthcare services, however the reality is no one could afford the privilege of private healthcare without the associated health insurance. An extended length of stay in an Intensive Care Ward of a hospital can quickly run into millions of rands which no one really has just ‘lying around’ as disposable income. There are the hospital costs, the anaethetist fees, surgeon fees, medication and a whole range of incidental expenses linked to a single health event. A consultation with a specialist can easily cost over R1000 a time, and that excludes the potential pathology and radiology costs if you need blood tests or x-ray scans done. The Health Market Inquiry is running at least one year behind schedule with no end in sight because they are still trying to get to the heart of healthcare, and therein lies the problem, private healthcare is treated as a commodity, but it is anything but that for the consumer who gets sick. To that medical scheme member, it is a need. A necessity. A non-negotiable expense that is worth selling your house or car. Bottom line is that it has become too expensive because no one questions the cost. It is not a ‘nice-to-have’ but a ‘must-have’. Furthermore, in order to ensure that their members can have direct access to healthcare treatment, medical schemes generally reimburse healthcare practitioners, pharmacies and hospitals directly, unless there exists a good reason not to. As a result of this historic practice and the complex nature of healthcare coding and medical scheme benefits, members do not check their statements or question the cost of the services they receive. They do not shop around for the cheapest hospital, nor do they negotiate the lowest rates with their doctor, they merely accept what they are told because they have no incentive to do otherwise. On the contrary, they have every incentive to get healthy as quickly as possible. It is much easier to fight with the medical scheme to pay for everything after you are healthy again, than to negotiate upfront with your practitioner or surgeon when you need to get the treatment urgently. And this is the underlying problem, it has become just too easy to get paid with no one asking questions. Healthcare providers and facilities are remunerated on a fee-for-service basis and an empty bed or waiting room is money lost. That is the reality of considering private healthcare a commodity - every life is associated to a rand value. 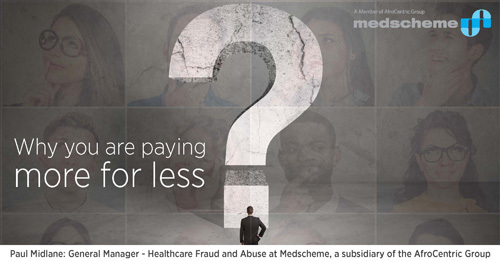 Administrators and Managed Care Organisations are constantly accused of unnecessarily increasing medical scheme costs, yet they exist to be the gatekeepers for the non-profit medical schemes by ensuring that a member receives the highest quality treatment for the most cost-effective price. It is a delicate balancing act that will never keep everyone happy all of the time, but a critical function nonetheless that has provided important sustainability to a very vulnerable industry. The reality is that medical schemes pay over 92% of contributions they receive directly towards healthcare expenses, which is phenomenal when compared to other general insurers who often spend anywhere between 10% - 20% on claims processing and administration, in a much simple and less complex environment than healthcare. If there weren’t controls in place to process and pay healthcare claims, medical schemes would have been bankrupt a long time ago. If your medical aid didn’t have medicine formularies or treatment programs for chronic conditions such as diabetes or HIV / Aids, they would run out of money within a matter of months. Medical schemes and their administrators are having to spend substantial sums of money on analytical software capable of detecting irregular claims and ensuring only valid healthcare claims are paid to healthcare providers and facilities. Opportunistic fraud and abuse is rife amongst healthcare practitioners and facilities where it is estimated that at least 10 – 15% of all claims are fraudulent or highly abusive in nature. In a R150 billion industry, that is a substantial expense. As with fraud in any industry, healthcare fraud and abuse occurs in many different ways and is much harder to contain due to a variety of factors, including but not limited to: the volume of claims associated to one healthcare event, the need to quick access to healthcare, the emotive nature of the story linked to every claim submitted, the unintended consequences of Prescribed Minimum Benefits and the inherent assumption that a healthcare provider or facility is compelled to act in your best interest with little consideration to potential downstream costs to your medical scheme. All these factors combined have created a perfect storm. Payment by your medical scheme has become an expectation, a right that cannot be denied, even if no one asks or cares how much. The almost blinded perception that no expense can ever be unreasonable when it comes to healthcare. As long as a medical scheme continues to pay, a person will not ask whether the physiotherapist or dietician at the hospital was actually a necessary expense to incur, nor whether that 15 minute specialist consultation was worth R1200, or if the pharmacist has dispensed the generic but claimed for the more expensive original, or if your medical scheme also paid for that pathology account you keep getting in the mail. The only time questions will be asked is when the double-digit increase comes at the end of the year, and even then the questions only momentarily linger until the next time you or your family fall ill and they once again become irrelevant.